Over the years, I have learned to feed a headache. If I get a headache, I immediately feed myself, before I even think about taking a pain reliever. Food is my first instinct. The saddest part of this ritual is that most of time it doesn’t even work. I would say that 90% of my headaches are caused by sinus allergies. Most of the time, I get a headache, eat and then wait an hour in pain until I finally give up and take a Sudafed. This is all because I don’t like to take pills. My grandma was the kind of woman who thought pills were the answer to everything. I remember at a very young age deciding that I wasn’t going to be like that when I grew up. I didn’t want to have bottles and bottles of pills. I was going to find ways to get rid of my pain without Tylenol 3, Darvocet and carisoprodol. If I couldn’t then I was just going to have to be in pain. I found ways to deal with my pain without pills. Sadly, it was with food instead. So, I’m breaking myself of my habit of feeding my headaches. When I get them, I am consciously staying away from food and taking a Sudafed instead. It’s a difficult habit for me to break because about 10% of my headaches are actually caused by me needing to eat. I’m slowly learning to tell the difference. Until then, this is going to be an interesting journey. I had a food related headache my first day of ww. It would be easy for me to feed myself with every twinge. I heard recently that drinking water will relieve a headache. I tried it and it sure works for me, mind you I probably live in a dehydrated state a lot of the time! If you have frequent sinus headaches, I recommend you get a neti pot and learn how to use it. None of the side-effects of drugs, and really,really soothing. Just remember to use salt to create a saline solution, because plain water will cause pain. I don’t know about sinus headaches persay. But, I have cured my migraines related to that time of the month with food. Believe it or not the week before my period I know when this is because of my swollen breasts. I eat brocolli and coleslaw once a day. All cruciferous vegetables help rid the body of estrogen. Thus a gentler dip in estrogen. 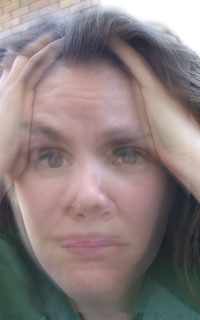 It is the radical dip in estrogen that causes a hormonal migraine headache. By the way, eat the vegetables raw or lightly steamed to keep the vitamins and indoles, etc. intact. The above advice is good advice once you find out that you are eating to comfort headaches, which you did Laura. Now you have a choice when you have a headache again…….Good job for finding out. I once ate a pack of M&M’s when I was cold instead of reaching for my sweater. Now that I know, I make sure that I have sweaters, pullovers and house shoes available along with keeping a sweater and pullover in the car.